“I want every woman to know she does not need to be defined by her story, but that her story helps her find who she is,” Sidford said. For many women, courage is all they have in their darkest times. Terry Sidford, a certified life coach, has long been fascinated by the courage ordinary women show in extraordinary circumstances. 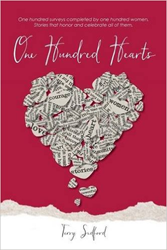 Her new book, “One Hundred Hearts,” shares stories of the defining moments in the lives of one hundred women. Their experiences range from hilarious to heartbreaking, but each one is powerful and inspirational in its own way. Sidford overcame a difficult upbringing by developing her own inner strength and was curious to learn about the ways other women handled situations requiring courage. For more information, visit http://www.onehundredhearts.com. Terry Sidford has been a certified life coach for the past 15 years and has assisted scores of people in achieving their dreams, which she believes is her own life’s purpose. She was professionally trained by The Coaches Training Institute and received an Associate Certified Coach credential from the International Coaching Federation.